The growth hormone test (GH test) measures the HGH blood level. The growth hormone test, or HGH test, measures the growth hormone blood level. Why is an HGH test important? This HGH blood test can help identify a growth hormone deficiency or excess. Is there any special preparation required before getting an HGH blood test? If possible, please avoid exercise for 30 minutes before getting this growth hormone lab test. This Growth Hormone Test is a blood test. The growth hormone test, sometimes known as a GH lab test, HGH test, HGH blood test, growth hormone blood test, and a GH test, measures the growth hormone blood level. Growth hormone (GH) is a hormone and protein that is very important in cell and tissue growth, protein synthesis and glucose metabolism. Also known as somatotropin (STH) or human growth hormone (HGH), growth hormone is made and released by the pituitary gland. Growth hormone levels are regulated by several hormones made by the hypothalamus, typically triggering pulsatile releases of GH out of the pituitary every four hours with a major surge occurring one hour after sleep. Functionally, HGH stimulates the liver to increase blood levels of IGF-1 which is why it is sometimes ordered with the IGF-1 test. IGF-1 helps promote tissue and bone growth. Excessive levels of growth hormone can cause headaches and visual problems. Chronically high GH levels lead to jaw and digit thickening (acromegaly), nerve problems and weakness. Low HGH levels can cause growth retardation, an increase in fat mass and decreased muscle mass, decreased energy and delayed puberty. To get a growth hormone test near you, simply order and get tested at the Quest Diagnostics lab you selected. Once the HGH lab report is ready, it will be available for download. 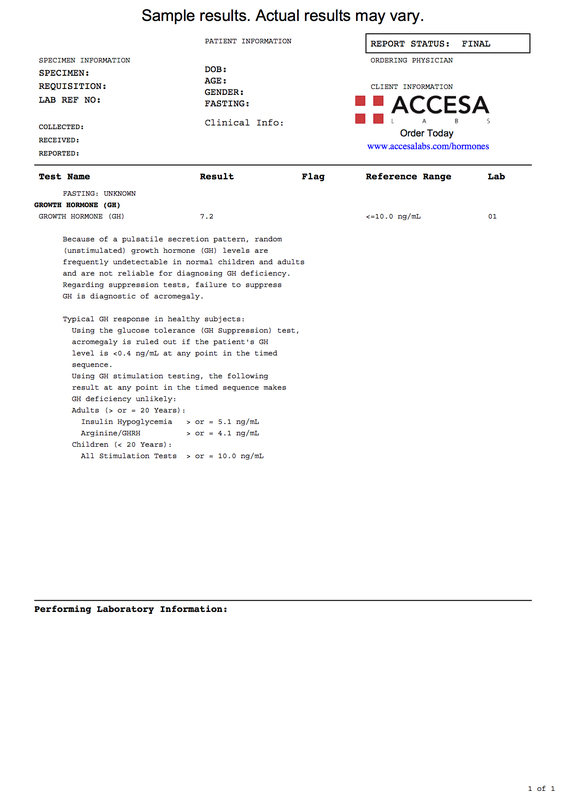 As can be seen on the sample growth hormone lab report, the GH blood level is reported as a numerical value and can be compared against the reference range provided by the lab. It is recommended that one avoids exercise for 30 minutes before undergoing an HGH test. HGH replacement has become more prevalent as an off-label anti-aging supplement. HGH supplementation has been banned from many professional sports due to its anabolic effects. Growth Hormone Test at Guaranteed Prices.